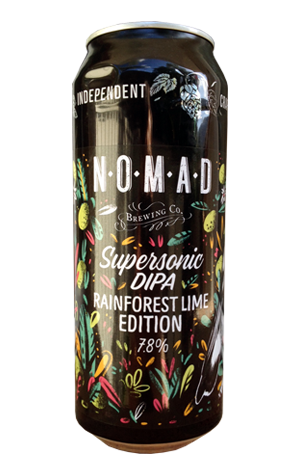 A second in quick succession within the growing series of Supersonic double IPAs from Nomad has arrived in the form of a Rainforest Lime edition. Taking inspiration from the original Supersonic but with rather a lot more to do with the recent Finger Lime edition, this one sees the surprisingly malt-driven demeanour of its predecessor set aside for something that really does throw the lime to the fore. It starts off strong, serving up aromas of orange, grapefruit, passionfruit and a touch of peach before the action moves swiftly to your palate. There you have a medley of Mosaic and Citra hops and native rainforest lime combining in the manner of a lush tropical fruit punch that gets carried along by a pleasing level of sweetness. This also seems to keep the most pressing bitterness at bay, leaving you with a enlivening citrus and limey twist at the end. As with the Supersonic Finger Lime, this latest version hides its 7.8 percent ABV well enough that you’ll be down the bottom of the glass before you know it. After a fairly quiet period, Nomad’s Supersonic journey has become rather interesting in recent times. It’ll be intriguing to see where it takes off to next.